school that does not comply. can withhold state aid for those non-citizen students. Symbolic Gestures of Nothingness. Save the turtles. Save your career. Save Golden Gate Theater—here’s what you can do right now! This entry was posted in culture, Gente, Greater Los Angeles, Politica and tagged Arizona, immigration by El Random Hero. Bookmark the permalink. One solution would be to not call it “Raza”, or any other name distinctive to Mexicans and Mexican Americans. Just call it, say, Southwest American studies. Period. Yet still teach the same things. Just remove all text specific to one ethnicity….but, keep the pictures and overall theme that is specific to Raza. This would make Raza studies no different than the white studies taught in basic classes. Look at any US history book, sans maybe a couple of chapters, EVERYONE is white. But they just don’t call it white history. So employ the same concept. Just don’t use words specific to any race, yet teach the same thing. I imagine they’d soon modify the law to where images and themes couldn’t be specific to one race, either. No problem. That’s where you then go after basic history and social studies courses for their images and themes being 99% white. Fair idea Rob, but some people on the raza side will not concede one inch to the demands of the right because of having fought so hard to make these classes reality. My heart goes out to the Arizonains targeted by these racist bills…But is anyone aware that within our own LAUSD, only a few of these classes presently exist? The majority of schools,even on the Eastside do not have them.A lot of folks,even Latinos feel that Chicano Studies should exist only within the realm of the college and university. Oh, I hear ya. I thought about that as I was typing it. Like every single stroke of the keyboard. I expected about 10 responses with people saying what you said, albeit even more harshly. I wouldn’t see it as caving into the demands of the right, just beating them at their own game. Standard history books ARE white history books, well, white American history. We all know that. Yet if you were to accuse them of being white history, they would tell you it’s nonsense because it clearly says “American history”. I say play the same game. But at the end of the day, you’re right. It’s deeper than that. It’s about power pushing its way around. And at some point it has to be confronted. Chuck D of Public Enemy said years ago that he doesn’t believe in boycotts, that he instead believes in confronting wrong head on, not just giving it a silent treatment. I, on the other hand, am a part time wannabe lawyer/part time wannabe screen writer so I’m more party to the do whatever works perspective. And I think using the man’s own rules against him is as beautiful and natural as a flowers in the spring time. Do the ethnic studies classes actually promote the overthrow of the US government? I’ve been in a few in college and they aren’t really radical or anything. They do nothin of the sort Spokker. They educate people on other cultures’ contributions to this country, which is often unfortunately lacking in ublic education. At worst they portray the plight, oppression and activist movements of minorities in a compassionate manner (meaning not treating them like they are evil). Im full of a tremendous amount of cultural and community pride but am definitely not one for identity politickin, but the assbackwardness of race relations and undestanding by most in this country would incline me to think ethic studies is badly needed. I notice the word “militant” is only applied to minority activists. I haven’t heard it applied to minutemen and tea baggers yet. Although I’d blame the media more for the perpetuation of this double standard, I’m sure the spirit of it came from our basic “american” history and social studies curriculum. “History” as taught in schools and popular media is an account of events, composed, and edited, true or false, or somewhere in between, that the dominant culture in a society has a need and even feels a duty, to present as biblical or scientific fact. This “revisionist history” insures that the dominant class or race in a society has an inherent, unshakeable, belief system, instituted, designed, and propped up as unquestionable fact, making evident to themselves and others, a manifest destiny or a Darwinian superiority of this ruling racial group, class, or ethnicity. The so called empirical evidence of this belief system can be witnessed in all facets of a society, this attitude and belief is designed overtly or even psychologically for the ruling group in a society, so as to enable the same group to continue to feel superior and be dominant. A society that becomes a multi cultural and multi racial society is in constant battle due the once dominant racial or ethnic group striving to hold onto their dominant position. The cosmology or history or legend of a society is important in that it convinces the dominant group and others in a society of an inherent superiority by one segment, “white man’s burden” or Gods chosen people, or many other conceptualizations are devised to instill a feeling of sovereignty in the dominant group and a sense of inferiority in any subculture of a society. Education and media are very specific tools that a dominant culture or racial group in a society can utilize to maintain control and dominance, and when any subculture starts to gain power and becomes a threat to the one racial or ethnic group that controls power and information, then that dominant group will do or say anything to maintain their preeminence. The USA is fast becoming a multi cultural multi racial society and this is the reason that we are witnessing laws enacted in places like Arizona that make it unlawful to teach ethnic studies and real history as it took place, unfettered by the history police and revisionists who’s real fear is of being looked upon as just other ordinary human beings. Democracy and human rights for all, now! Ideally, I would hope that the content of ethnic studies courses is rolled into existing history courses, whether or not there are separate ethnic studies courses. The history of America has many participants. It doesn’t begin with the voyages of Columbus, but when the first Americans came over the land bridge and settled themselves further South little by little over many, many generations. Even when you get into strictly United States history, a chunk of the Southwest was once claimed by Spain and Mexico. The United States just happened to be the empire that got to keep it. I’m not exactly sure what the anti-ethnic studies people are afraid of, but a history of Chicanos, Hispanos, Tejanos and others are as American as apple pie. I once took an American music history course and Native American, Mexican American and African American music got as much play as country and folk. That’s the United States right there. What the hell is the big deal? I’m certain that the antipathy for ethnic studies by the white right wing arises from fact these programs/ideas arose from the turbulent,”liberal” sixties, a period that is painted by these people as the root of many of the “problems” we face today. 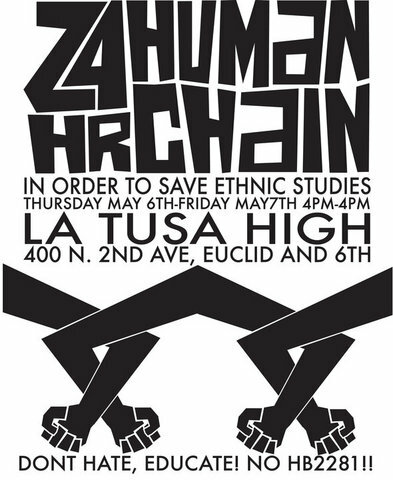 Also, when it comes to Chicano Studies specifically, there is a close association with MeChA, the student group founded at about the same time. Right wing sites such as Glenn Spencer’s “AmericanPatrol” like to hone in on what the acronym “MechA” stands for: Moviemiento Estudiantil Chicano de Aztlan. Also, they scrutunize MeChA’s symbollism(the black eagle clutching sticks of dynamite) and founding documents and are appalled by the “radical” concepts it promotes, namely the ideas of a chicano “homeland” and self-determination and its’harsh criticisms of U.S. institutions. As any MeChA member knows, past or present, the degree of “radicalism” of each MeChA varies from campus to campus. I am proud to say that I was a MeChA member at CSUN, considered by many to be very “radical.” However, as I look back at my experiences with this group and the issues we tackled(UFW grape boycott,saving the Chicano House,supporting Native American Studies,protesting the proposed elimination of remedial college classes and U.S. foreign policy,recruiting more raza to college,)I would characterize our activities as moderate,at best. Never was there any talk of some plot to overthrow the U.S.government.